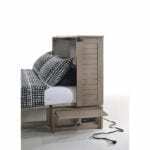 The Poppy Murphy Cabinet Bed comes in 3 finish options. This new Murphy Cabinet Bed is Gorgeous! 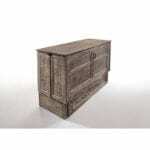 Our newest Cabinet Bed has a great brushed wire finish and iron hardware. Categories: Beds, Cabinet Beds Tags: cabinet bed, cabinetbed inc, Murphy Bed, night and day, Poppy, sagebrush, small space bed, tiny home bed Brand: CabinetBed Inc.
Complimentary curbside delivery is included. 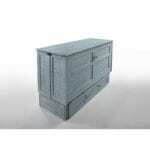 The Poppy Murphy Cabinet Bed includes a standard queen size premium memory foam mattress with cool gel. This fold-out bed is a remarkable sleep solution. It combines comfort, contemporary design, and affordability all in one. Whether you live in a studio apartment or just need an extra bed for overnight guests, the Poppy Murphy Cabinet Bed is a perfect choice. When not in use, the cabinet is a great HD TV stand and can support flat screen TV’s up t0 80 inches. This free standing Murphy cabinet bed is simple to use. One person can set up the bed in under 30 seconds. The bed features pop up nightstands and a handy USB power port. The storage drawer will store linens making this bed both compact and self sustaining. Available in Brushed Driftwood, Skye, or White Bark finishes. 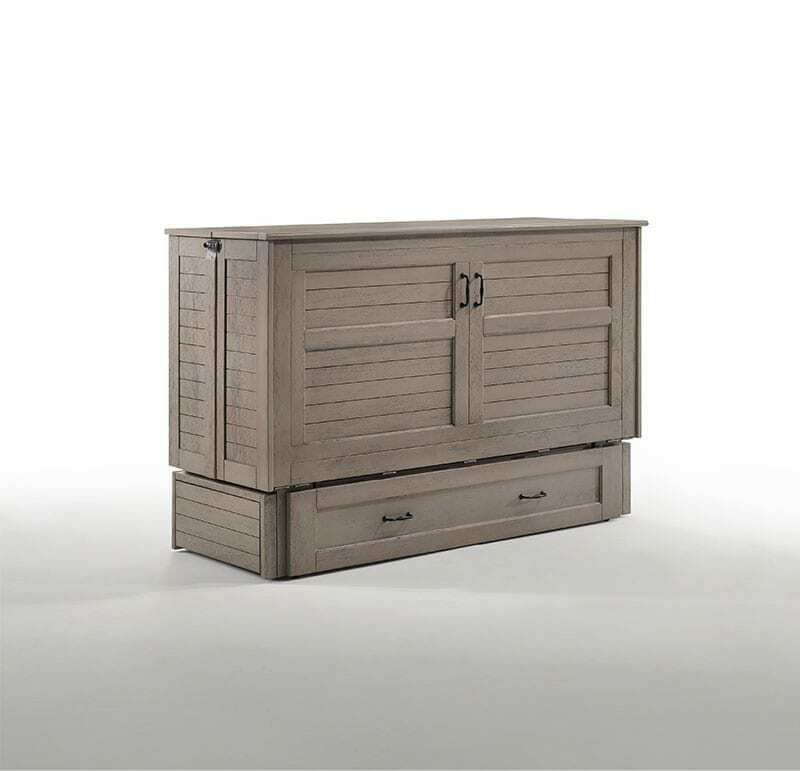 This Murphy Cabinet Bed is one of the newest additions to the Night and Day line. The Poppy bed comes with the gel top memory foam mattress with cool gel designed specially for this beds. They have a special gel top layer that keeps you cool and comfy all night long. The handy flip up nightstands on both sides provide a convenient place for your phone and a few other items. A USB port installed on the side of the bed is another convenience.